South Carlsbad State Beach extends from Palomar Airport Road to La Costa Ave. Unlike Carlsbad State Beach to the north, this beach has few amenities, except for the campgrounds, and is rather remote. Popular activities include swimming, surfing, skin diving, fishing and picnicking, and sunbathing. Good quality sand makes this beach ideal for walking and jogging. South Carlsbad State Beach Campground, the large bluff-top campground, is very popular, especially in summer. Stairs lead from the campground to the beach. This section of beach is located along rugged cliffs, making it rather remote. There are some safe access points to the beach. You can find these where cars are parked on the small turnouts along the highway. 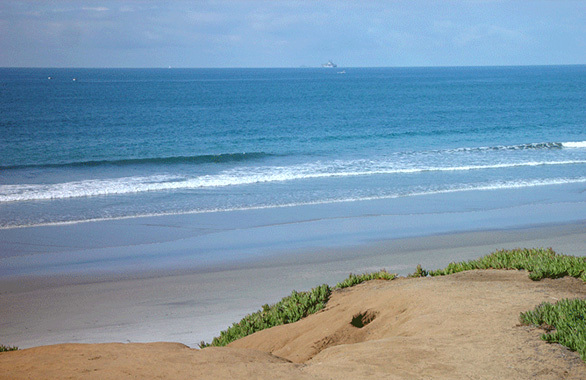 This section of South Carlsbad Beach includes Terramar Beach and North Ponto Beach. 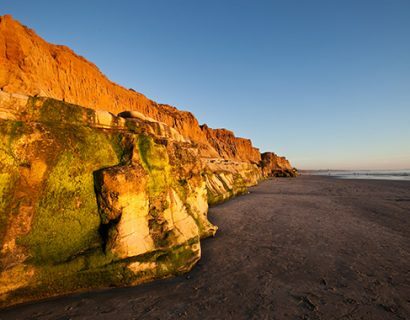 South of the campground, the cliffs disappear, and the beach opens up to Coast Hwy 101. This section of beach is unusually wide and sandy. The surrounding area is undeveloped, making this one of the nicest beaches in the county. During Summer, this beach is a popular spot for family and kids. The closes restrooms, however, are at South Ponto Beach parking lot and the campgrounds. The Batiquitos Lagoon is located on the opposite side of the highway. A jetty and water inlet separates the beach just south of the campground from South Ponto Beach, further south. South Ponto Beach has the best conditions for surfing. Surfing contests are held at Ponto from time to time. To the north is Carlsbad State Beach, the city’s other major beach. None (Nearest restrooms are at campground and South Ponto Beach parking lot). South Carlsbad State Beach Campground sits on a cliff overlooking South Carlsbad State Beach. There’s no day-use facilities, and it’s more isolated than Tamarack State Beach. On the beach south of the campgrounds, parking is available in spaces along Coast Hwy 101 directly in front of the beach. 6 am to 10 pm. Stairs from campground to the South Carlsbad State Beach are now accessible. A route from the Ponto Picnic Area to the beach is also accessible. Parking in the day use area is accessible. A beach wheelchair is available. Call (760) 753-5091 for information. 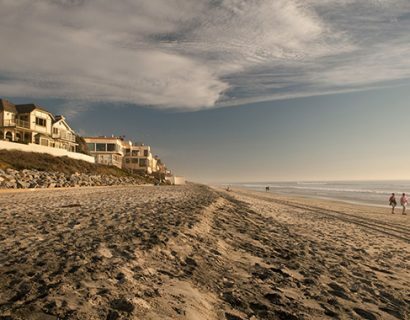 In all, South Carlsbad State Beach has a secluded section, hidden below cliffs with few access points, while the section south of the campground is a wide, open sandy beach, in an undeveloped area.